ActiveTcl is an industry-standard distribution of Tcl scripting language for Mac, Windows, Linux, AIX, Solaris, and HP-UX. The software’s completeness and ease of use streamline the operations of developers worldwide, while its quality-assured business solutions keep the infrastructure of corporate users 100% safe. It exhibits inimitable ease of installation on all major platforms and enables users to stay competitive with pre-compiled and ready-to-use extensions. The program is fully compatible with Tcl’s reference distribution; any Tcl installation that features the right extension will successfully run the code tested on this platform. ActiveTcl core comes complete with multiple precompiled Tcl/Tk modules which include Tc100 object extension, native system threading, virtual file system layer (tclvfs), compression library (zlib), enhanced Tk network library (HTTP), and precompiled bytecode loader (tbcload). ActiveTcl is a great time-saver for developers or corporate users utilizing Tcl on mission-critical applications or production servers. 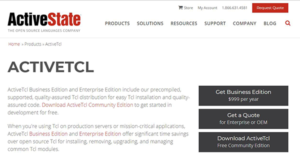 With ActiveTcl, users get significant time savings for installing, upgrading, managing, and removing popular Tcl modules for quality-assured code and easy Tcl installation. The program shortens the development cycles by allowing developers to leverage precompiled Tcl distribution for cutting-edge standardization and installation across all operating systems. It allows users to develop once and implement successfully across the entire development environment. Another great attribute is the direct access to Tcl support team. Developers enjoy the time-saving benefits of Tcl experts who enable them to not only save time but also get apps to the market faster. The support team allows users to keep development issue private while providing crucial expertise to SLAs to meet their business needs. This, enables users to focus more on the core competencies and ensure optimal uptime for business-critical applications. ActiveTcl offers an extended version and platform support. It extends the user’s ability to create application not only for common OS (Windows, Linux, and Mac) but also for AIX, HP-UX, and Solaris operating systems. One nifty tool for Windows is the Tcl Expect functionality. This is a robust feature used to automate access to all interactive applications. The tool allows users to control every application operating on Unix or mainframe servers from a Windows workstation. It enables developers to write scripts that employ multiple, extremely handy functions to systematize the difficult-to-automate tasks. Better still, Expect for Windows allows users to govern console-based remote applications through SSH, Telnet, or rlogin. If you are interested in ActiveTcl it may also be sensible to check out other subcategories of Best Rapid Application Development Software - RAD gathered in our base of B2B software reviews. It's essential to realize that hardly any service in the Rapid Application Development Software - RAD category is going to be an ideal solution that can match all the needs of all business types, sizes and industries. It may be a good idea to read a few ActiveTcl reviews first as some solutions may dominate only in a really small set of applications or be created with a really specific industry in mind. Others can operate with an idea of being simple and intuitive and therefore lack complicated functions needed by more experienced users. You can also find apps that support a wide group of users and give you a complex feature set, but this frequently comes at a more significant price of such a solution. Make sure you're aware of your needs so that you select a software that has specifically the functionalities you look for. How Much Does ActiveTcl Cost? ActiveTcl provides three plans in its enterprise pricing structure. We realize that when you make a decision to buy Rapid Application Development Software - RAD it’s important not only to see how experts evaluate it in their reviews, but also to find out if the real people and companies that buy it are actually satisfied with the product. That’s why we’ve created our behavior-based Customer Satisfaction Algorithm™ that gathers customer reviews, comments and ActiveTcl reviews across a wide range of social media sites. The data is then presented in an easy to digest form showing how many people had positive and negative experience with ActiveTcl. With that information at hand you should be equipped to make an informed buying decision that you won’t regret. What are ActiveTcl pricing details? What integrations are available for ActiveTcl? If you need more information about ActiveTcl or you simply have a question let us know what you need and we’ll forward your request directly to the vendor.